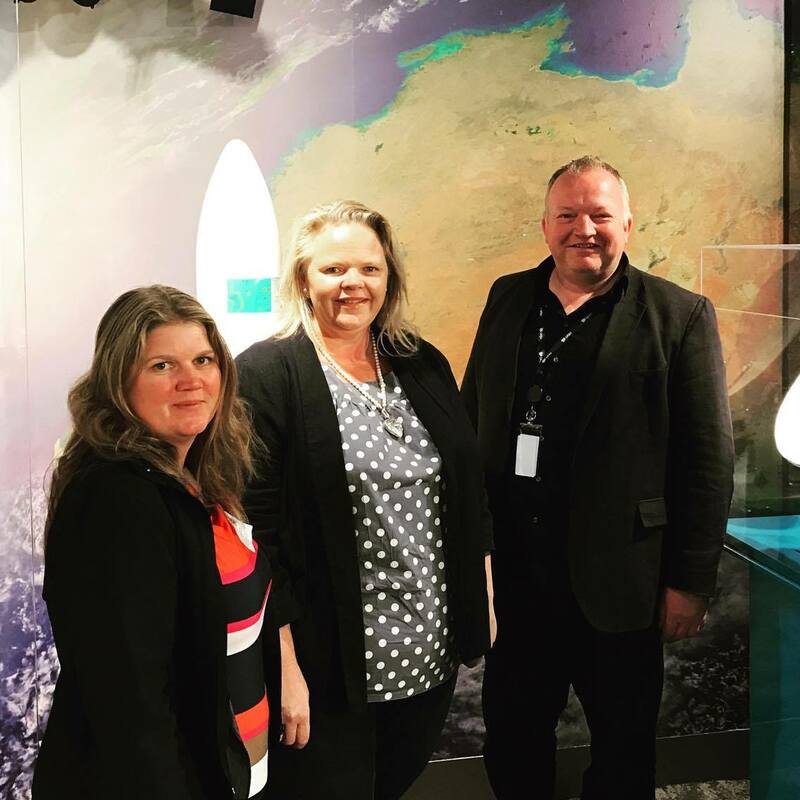 A chance to take the Data Drought battle to the major decision makers over the past fortnight saw BIRRR representatives head to Canberra, Sydney and Brisbane last week, taking in awards events, roundtable discussions, national forums and meetings with ministerial staff. Admin team members for lobby group ‘Better Internet for Rural Regional and Remote Australia’, Kristy Sparrow and Kylie Stretton, represented rural internet users across the country as they addressed the NFF National Congress and shared concerns with Ministerial advisors at Parliament House. Fellow admins Julie Stott attended the ACCAN roundtable in Sydney, while Amanda Salisbury joined Kristy for nbn video hookup from Brisbane. Kristy took to the stage in a panel discussion on ‘Telecommunications in the Bush’, before a large crowd at the NFF annual congress alongside Iñaki Berroeta (Vodafone), Bill Morrow (CEO, NBN Co) and Senator Fiona Nash (Minister for Regional Development, Minister for Local Government & Territories Minister for Regional Communications). She introduced the BIRRR group to those gathered, explaining its history, purpose and actions. 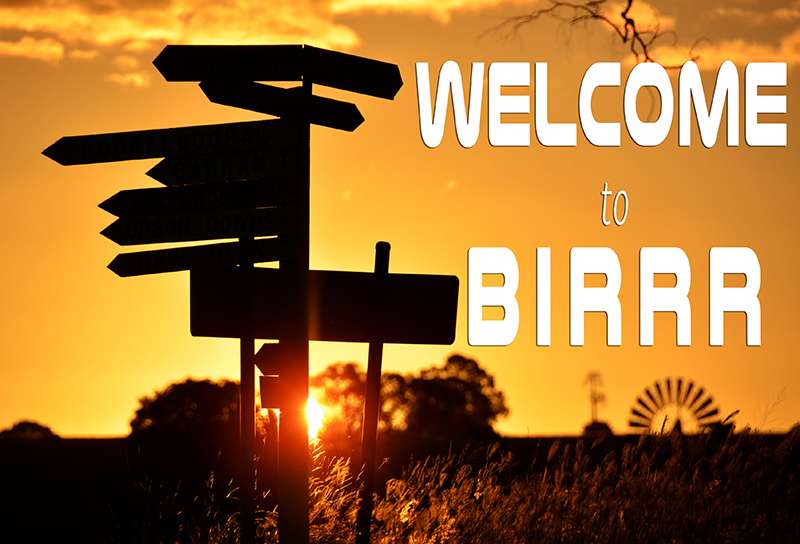 “BIRRR is a community of volunteers that help guide Tripe R people through the bush telecommunications ‘jungle’. 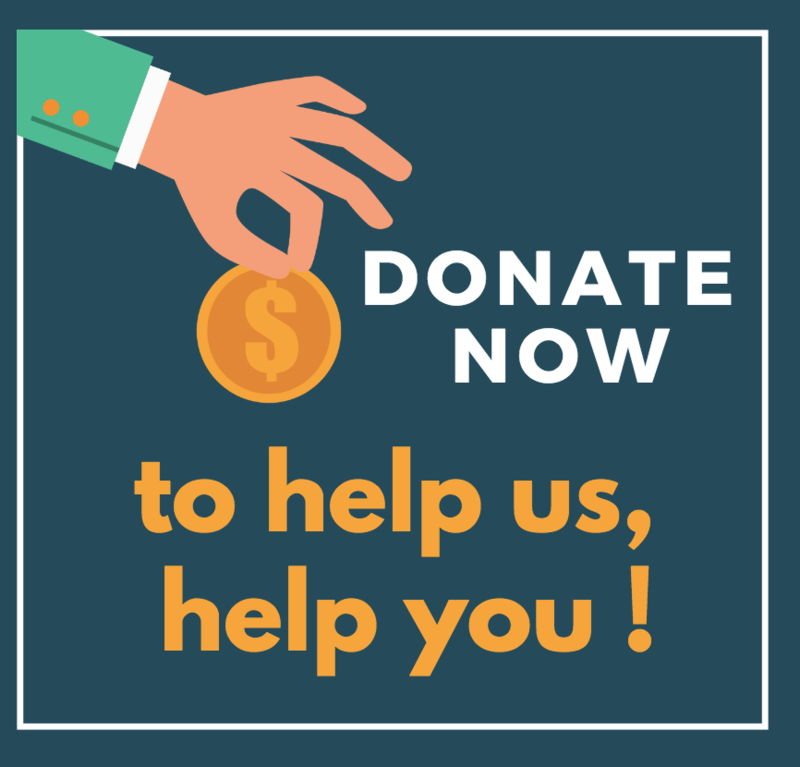 We have contributed over 8000 volunteer hours and filled a large gap that no one else seems to want to tackle. 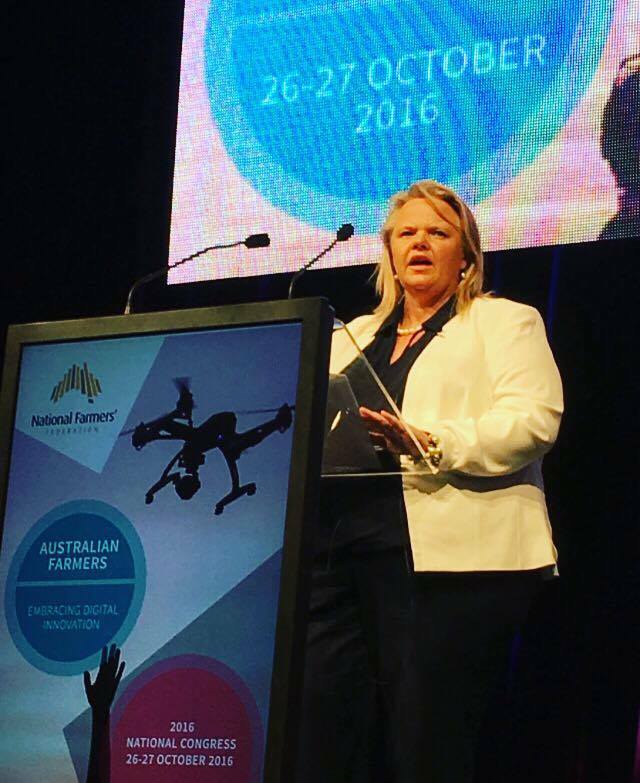 We work alongside all interested parties to highlight issues and to offer solutions where possible,” Kristy told the NFF Congress crowd. Kristy told individual stories of BIRRR members battling to gain decent connection to run businesses, educate their children and stay connected in an increasingly digital world. She also shared some interim results from a survey currently being run by BIRRR. Ongoing issues with the long-term internet satellite, SkyMuster, described by nbn as a ‘game changer’, were also addressed. One strong survey result shows that 42% of respondents using SkyMuster have no other form of internet. “We hope Sky Muster will become more reliable and that the so-called ‘teething problems’ that have plagued the last few months can be sorted quickly,” Kristy said. changed its call centre policy and protocols so that satellite end users will not be referred immediately to their RSP. nbn’s call centre will now be able to provide basic network outage information so that callers will at the very least know if the network is down in their area. set up ‘a dedicated regional support team inside this call centre to handle rural addressing issues, location I.D generation, non-standard fixed wireless installs, or other issues that people living in regional, rural and remote areas experience’. nbn will also incorporate this approach into its official Facebook page, nbn Australia. The announcement of this change of policy in the nbn customer call centre, just prior to the NFF Congress, was met with cautious approval. “We are looking forward to nbn providing more direct and responsive communication to end users – we will continue to work with industry groups and government to ensure nbn understands the significance of the data drought and the urgent need to address bush connectivity,” Kristy said. Providers & nbn to establish RRR call centres. “The bush needs urgent assistance in getting connected and having plans that meet their needs. For RRR regions to grow it is essential for businesses, families and communities to have access to, and be able to best utilise, digital technology. We need to ensure our towns and communities are not disadvantaged in the digital age due to our postcode and population. 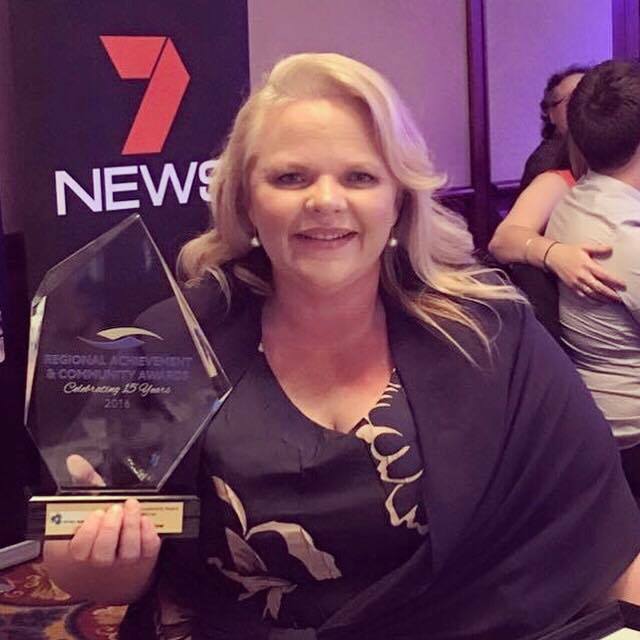 Kristy also recently won the Innovation and Leadership category at the Queensland Regional Achievement and Community Awards in Brisbane. “It has been a hectic couple of weeks, but we feel like we are making some headway in addressing bush broadband issues,” Kristy said. 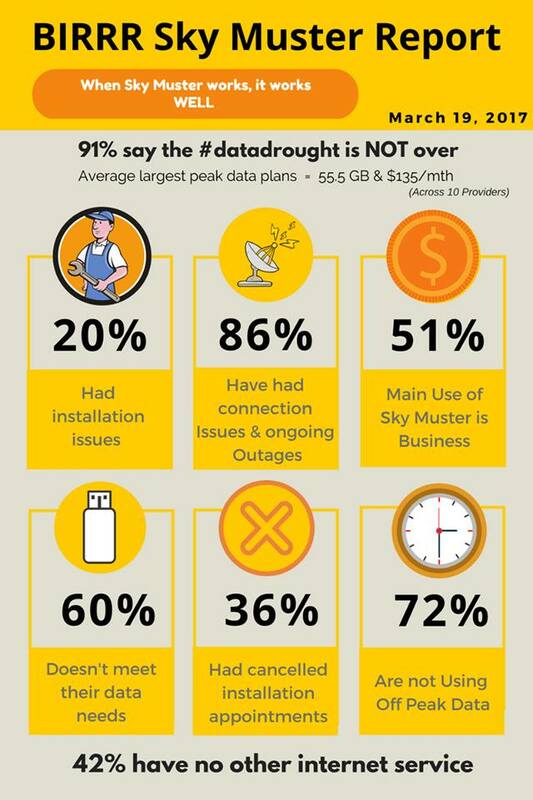 Sky Muster customers seeking nbn support on outages and nbn-related issues can call 1800 687 626 or email info@nbnco.com.au. The BIRRR group page can be found here, with website resource here. BIRRR Chief Admin Kristy Sparrow addresses the NFF Congress during a panel discussion on ‘Telecommunications in the Bush’. 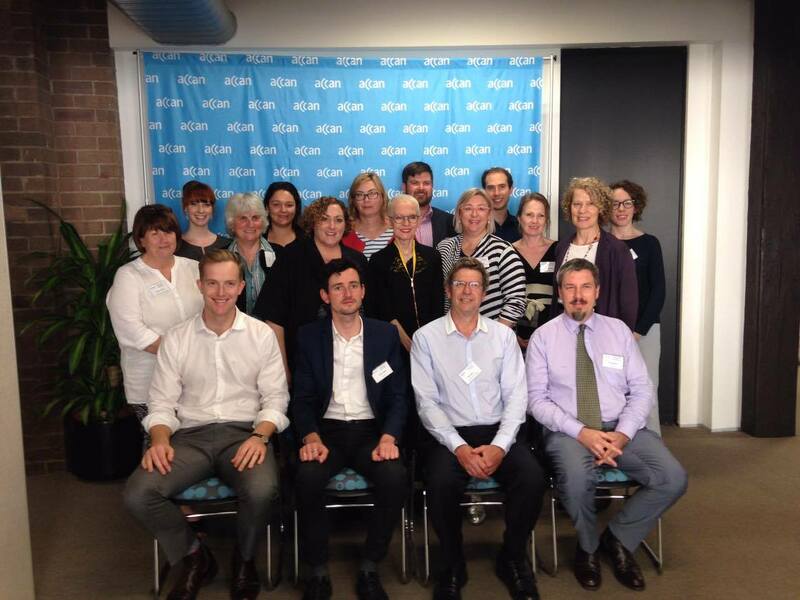 ACCAN roundtable group photo, including BIRRR’s Julie Stott (second from left, middle row). 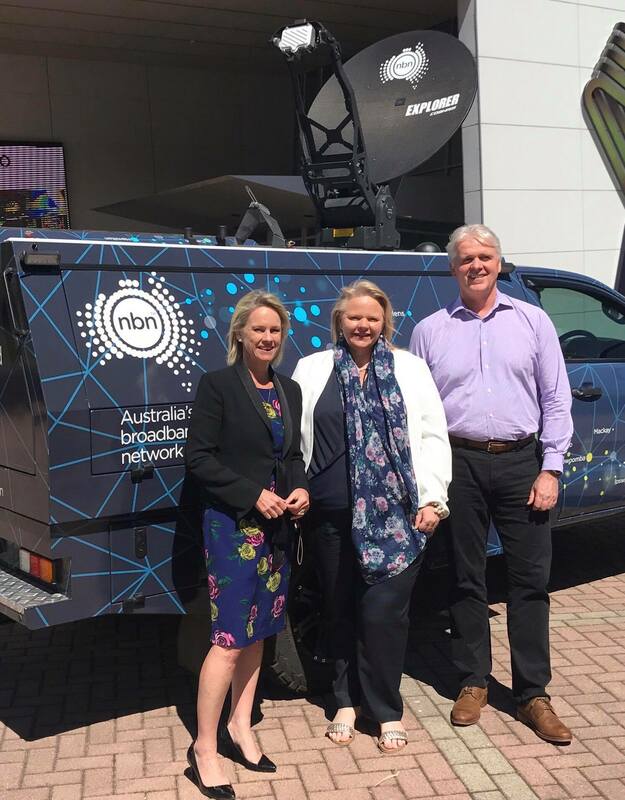 BIRRR admin reps Kylie Stretton and Kristy Sparrow toured nbn co headquarters while in Sydney, with Gavin Williams, nbn co’s Executive General Manager, New Developments, Wireless and Satellite. This article is particularly helpful for nbn Sky Muster Satellite customers. Wondering how to best utilise your off peak data? Here are some ways to get the most out of your satellite plans. Mac Systems: You need to perform a few simple tasks to prepare for scheduled downloads. First, go to System Preferences > Energy Saver and press the Schedule button. Check the Start up or wake check box and select the time for your Mac to wake. You want it to wake at least 1 minute before your Calendar event will fire, to ensure that you are connected to the Internet. Once you have set the wake day and time, click OK and close the Energy Saver window. Operating system updates for Windows 10 and Apple iOS are AUTOMATIC, you cannot schedule them. Earlier versions of Windows can be scheduled. Once you have installed the download scheduler application you can choose the time/day you wish to download the file(s). WARNING: Please be careful with download manager add-ons, some have been known to be malicious and deliberately spam users or Hijack user’s computers. Do not click on any pop ups, links, ads or programs that promise to speed up your computer or internet connection – these often contain malicious software. These links or ads are especially common on popular speed testing websites. MAC Users: The following link shows you how to schedule downloads (apps, music, movies, TV shows etc) in off peak times in itunes using a Mac CLICK HERE You can also use this method to update apps in off peak times and then connect your i-device to the computer / itunes and update on your device or transfer downloads without using data. Use the following links to sync your dropbox files at night during off peak times. APPLE: Apple iOS are only automatic if you are connected via WiFi or cable. If the device is Cellular only, it is NOT automatic, and can be scheduled but therefore can’t use your Sky Muster off peak data for these updates. Email Scheduler for Gmail lets you schedule email messages inside Gmail with the help of a Google Spreadsheet. You can write your messages now and Gmail will send them later at your specified date and time, thus you can schedule it to use your off peak data. The scheduler can also send recurring emails that go out automatically on daily, weekly, monthly or yearly repetitive schedule. Microsoft Outlook can also schedule delivery (and reception) of email messages. *Please note, while all care has been taken in compiling BIRRR documents, we recommend that you check with your ISP regarding off peak data if you have any concerns. As the #datadrought mainly impacts satellite customers with off peak data we have focussed on off peak data for these customers. Thanks to BIRRR members Julie Stott & Kye Rosendale for assistance in compiling this document. The Better Internet for Rural, Regional and Remote Australia (BIRRR) Regional Internet Access Survey, released this week, has revealed critical problems with Australia’s current internet options, and warns of long-term consequences if changes are not urgently made. The survey, distributed through the BIRRR Facebook group, investigates current consumer conditions for people in rural, regional and remote areas of Australia using the internet. The in-depth report found that rural, regional and remote people are severely disadvantaged in terms of access, speeds, cost and reliability of their internet connections, whether they be via mobile broadband or via satellite. These issues have had (and continue to have) a dramatic effect on rural, regional and remote peoples business, the education of their children and themselves, and on their personal well-being. It also illustrates the notion – even with the onset of NBN’s Skymuster – that data growth will soon outgrow the nbn Fair Use Policy that will see 75GB/month peak use data limits on customers. BIRRR founder and admin Kristy Sparrow said the results reinforce the need for an independent telecommunications advisory body to help guide consumers through the bush broadband ‘jungle of options and answers’, along with an established universal service guarantee for regional Australians. “There needs to be an established service guarantee for internet services Australia wide. Service for regional, rural and remote customers should be equitable in terms of speed, download capabilities and costs. The survey was conducted up to the end of January 2016, and reflects the incredible frustrations endured by those living and using internet beyond Australia’s city limits. “There is little doubt that the world is becoming more and more centred around the internet – from business accounting clouds to online education courses and distance education, from virtual medical consultations to emergency contact points, from the latest app developments for farming ventures and simple tools of communication, it’s all happening online. The BIRRR survey reflects also community concerns about accommodating the growth of data use. This same ABS report showed that, on average, each Australian household has eight Internet connected devices – already many bush connections cannot support that load, and there is increasing concern that data limits announced for SkyMuster by nbn will simply not be sufficient into the future. Another major ‘sticking point’ are off-peak periods to be enforced via Skymuster. “With much of the data available on plans currently being offered to customers looking to use SkyMuster only accessible between 1am and 7am, it is simply not ‘user friendly’,” Mrs Sparrow said. 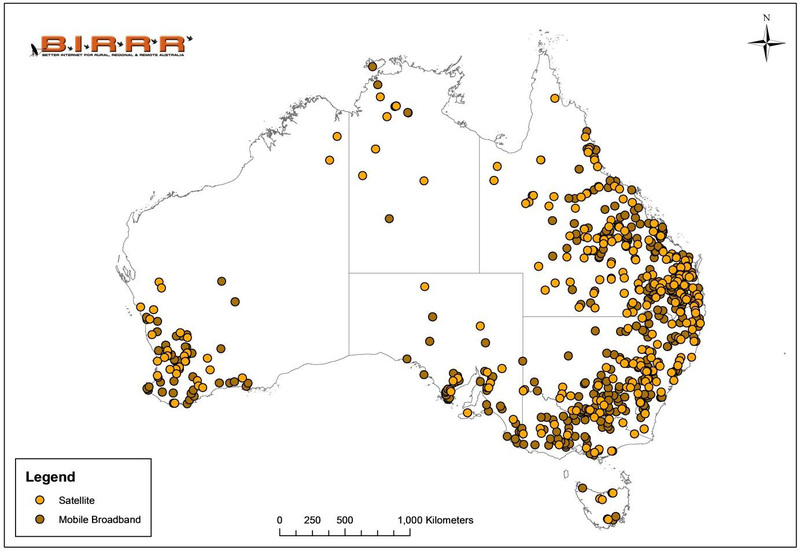 Respondents came from right around Australia. Overwhelmingly, current services do not meet needs. Among the many hurdles – registering to find out nbn availability! Figure 24: Reinforcing the need for an independent telecommunications advisory body to help guide consumers through the bush broadband ‘jungle of options and answers’. A very special thanks to Rachel Hay, PhD Student & Sessional Lecturer, James Cook University, Townsville, for compiling and analysing survey data for this report. 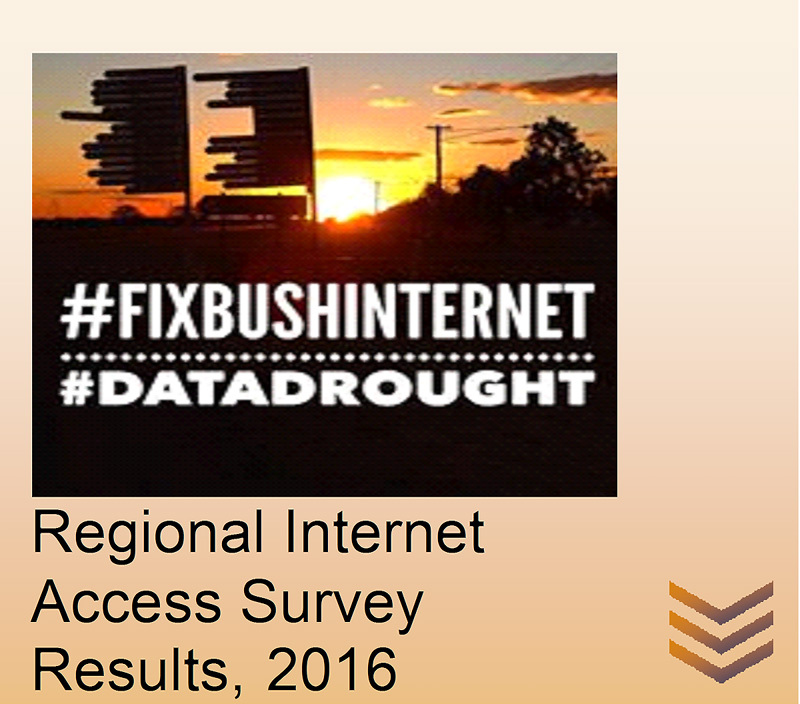 Announcing the release of the 2016 SURVEY RESULTS for REGIONAL INTERNET ACCESS!!! If you use an Android phone or device, this could concern you. At 1:30pm today (Thursday March 10) the Sydney Morning Herald, reported that malware has hijacked Android banking apps for Australia’s big four banks. Commonwealth Bank, Westpac, National Australia Bank and ANZ Bank customers are all at risk from the malware which hides on infected devices waiting until users open legitimate banking apps. The malware then superimposes a fake login screen over the top in order to capture usernames and passwords. 1. Essential: Do not open any bank app on an Android device – don’t tap or touch, just delete the app, until you hear more from your bank. 2. Mandatory: install a virus app on all Android devices and phones. Avast is free and excellent. Your home computer antivirus program can come with up to five licenses, which might include versions for your android phone – it’s worth checking out. This link has a list of more security apps. 3. Immediately. If you use a banking app on your Android, change your banking PIN/passcode. NOW. But NOT on your Android phone. Do it by phoning or through your computer browser or Apple device. If you use that same PIN/passcode for any other account, it may now compromised – go change those now, too. 4. Consider banking within a secure password vault called Lastpass (browser and app). It is convenient and very secure. You open the Lastpass app, launch your bank within the app’s vault, the login is automatic and opens within the app – no need to keyboard in your password (great if you ARE using free Wi-Fi). And, you do not have to remember the password, making it easy to create a different password for every account. 5. Don’t use the same PIN/password for every account. If you have problems remembering them, use the Lastpass password generator, or create a secure easy to remember password from a phrase or poem. Here is a mnemonic password generator that will create an easy to remember password for you. 6. All users, on all operating systems, should be very wary of using free Wi-Fi. It is much easier for hackers to come into your device through unsecured Wi-Fi. PLEASE NOTE users of Paypal, eBay, Skype and WhatsApp – at this stage the malware seems just attacking the banking apps, so delete them and scan the device …if you think your device has been affected, then change ALL your passwords. This article produced by BIRRR, with assistance from a number of tech experts. Apple released iOS-9, a major operating system upgrade, on Sept 16th. The good news is that the iOS 9 update is smaller than usual, at 1.3GB, the bad news is that there is a lot of other data usage that comes with the update, data demand that will multiply if you have many Apple devices. The heavy, data demand includes: updating your computer’s iTunes; backing up your devices; updating the operating system; reinstallation of your apps; and, the updating of your apps to be iOS-9 compatible. Plan your data use: Prevent auto-updating on all your devices. toggle-OFF both ‘Apps‘ and ‘Updates‘. Make space: Review your apps, photos and videos and uninstall unused items. It will be a tough task for many 8/16 GB iPhone or iPad users to free up enough space. Here’s how. Get iTunes ready: Install the latest version of iTunes on your computer. Here’s how. Update Apps. Use iTunes as download-central for app updates across all your devices. Here’s how. Sync your device to iTunes. Make sure all your devices are synced across iTunes. Here’s how. Backup your devices. Backup to iTunes (not iCloud) if you are data challenged. Here’s how. Once Apple releases the iOS 9 update, you will see a pop-up on your iOS device notifying you that a software update is available. It is recommended that you wait a couple days after the launch to update. There’s always a chance complications will surface. If you’re not the type who wants to spend time troubleshooting issues, it’s best to wait a few days after release to update. You can download directly through your device but doing this wirelessly will take longer and may exhaust your mobile data. A better suggestion is to update through your computer, using iTunes. Plug in the device charger, so you won’t run out of battery and lose the download. Connect your device to your computer and update via iTunes. Here’s how. After the update, review that your apps are all up-to-date by repeating steps 4 and 5 above. Many people have been finding that Windows 10 has been a bandwidth hog, and this is due to Microsoft new forced updates policy, but it dosent mean there isn’t a way around this. Windows 8 is also guilty. These simple steps will help you to reduce the amount of data windows uses. Navigate to the signal icon on the task bar. 2. Click it to bring up the list of networks and find the one you are currently connected to. Microsoft is currently offering the operating system for free for a limited time to Windows 7, Windows 8, and Windows 8.1 users – until 29 July 2016. The free upgrade will not be available for those using Windows XP and Vista, but there are still upgrade options available. No one is forcing you to update to Windows 10. There are plenty of happy people with computers that “just work” running Windows XP or Windows Vista. Microsoft, however, no longer issues security updates and patches for Windows XP. This means that your PC is more vulnerable to malware. Windows Vista will no longer be receiving these patches in April of 2017. Windows XP support no longer operates. If you are running XP and having issues this is probably the cause and now is the time to upgrade. You can do an upgrade for XP and Windows but it will cost you to do so. Windows is offering a box version for sale to XP and Vista users. Remember you have until July 2016 to do the free upgrade and it would be a good idea to wait until a few more bugs are sorted from the upgrade before proceeding if you want to limit the amount of data that you have to use. If you are short on data and want to install Windows 10 you don’t necessarily have to do it via the Windows Update and use your data allowance. You can download a file (3GB) to a USB stick at https://www.microsoft.com/en-au/software-download/windows10, and the USB will work like an installation disk (to start, click on the ‘setup’ file on the USB). Maybe if you are able to get to a faster internet connection somewhere, e.g. a library in town, you can download it there. You can also share the USB stick with others, it will work on multiple PCs with authorised copies of Windows 7 and 8. What if I do not want to update to Windows 10? Again, no one is forcing you but Windows will no longer be issuing security updates and patches. This makes your computer vulnerable to malware and makes your computer unstable. Click on the Start button, followed by Control Panel. Click on the System and Security link.Note: If you’re viewing Control Panel by Category, you’ll see this link. If you use the Large icons or Small icons view, just choose Windows Update and then skip to Step 4 below. In the System and Security window, click on Windows Update which is one of the bigger links and located about mid-way down the list. With Windows Update now open, click the Change settings link on the left.This will open a window with the heading Choose how Windows can install updates. The settings on this page give you a fair amount of control regarding how Windows 7 will receive and install updates from Microsoft. What about the major problem everyone had with Windows 10? Like everyone else on the BIRRR you probably saw the horror stories about the continuous rebooting and downloading that happened with the initial Windows 10 upgrade. This was caused by an update KB 3081424. Windows released an update – KB3081436 – and this has reportedly fixed the rebooting issue. So if you were one of the early updaters and you stopped the process because of the rebooting you should be right to re install. Press start button, scroll to control panel, opening the Control Panel, clicking on ‘View installed updates’, selecting ‘KB3081424’, clicking uninstall in the toolbar and restarting the computer. The other issue with Windows 10 is that they have decided we will not have a choice when and how we receive updates. This is a problem for those of us on limited downloads. There is no way to turn off automatic downloads in Windows 10 but users can turn their network connection to a metered connection. 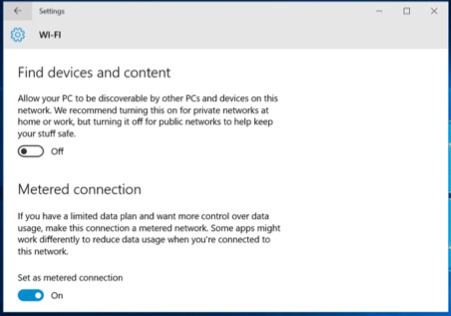 When you set a connection as metered, you’re telling Windows it’s a connection with restricted data — such as a mobile data connection. Windows won’t upload updates on a metered connection — it won’t even automatically download Windows updates. To set your current Wi-FI network as a metered connection, open the Settings app and navigate to Network & Internet > Wi-Fi > Advanced options. Activate the toggle under “Set as metered connection.” The current Wi-Fi network will become a metered connection. This will allow users to choose when they do updates depending on the amount of data they have or access to free Wi-Fi. This means users will have to regularly change the setting back to un metered at which point the upgrades will automatically download. The updates are not going to be as large as the initial upgrade and they do keep your operating system running as efficiently and safely as possible. There is also the issue that if you switch to metered and forget to upgrade for a while, you will have to do a large upgrade when you do remember. Note – Ethernet network connections can’t be set to metered. If your internet connects to your computer with a cable that looks like this, then you are using an ethernet connection which cannot be set to metered. If you are connecting by a different type of cable/connection (for example, so types of mobile broadband modems) then it may or may not be possible to set it as metered, depending on your modem. If you are connecting using WiFi, then you can set as metered. What’s a metered Internet connection? Internet service providers can charge by the amount of data used (the amount of data sent and received by your PC). That’s called a metered Internet connection. These plans often have a data limit, and if you exceed the limit you might have to pay extra. In some cases, you aren’t charged extra but your connection speed becomes slower until the billing cycle ends. WiFi networks—Windows sets WiFi networks to non-metered by default. But if your Internet service provider charges you by the amount of data you use, setting your network connection to metered can help you limit your data usage. Mobile broadband networks—Windows sets mobile broadband networks to metered by default. But if your mobile broadband service is actually unlimited, then you might want to change the network setting to non-metered. If you’re not sure what to do, keep an eye on your data usage. If you find that you’re being billed for extra data usage, setting your network connection to metered can help you manage this. You may also need to ensure that your Windows 10 Computer is not using data to update other computers nearby. It is useful to read this article, which shows how to turn it off.